It’s time to wrap up another great year of music, art and positive vibes at the Training Shed. 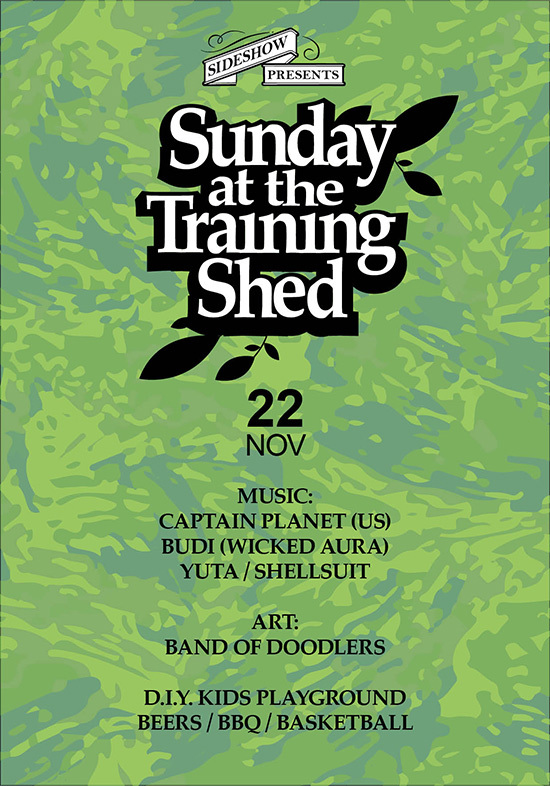 Tropical music producer and DJ Captain Planet, Yuta of Sonido Singapura, Sideshow resident Shellsuit and Budi from Wicked Aura Batucada provide the soundtrack, while a 20 strong team from Band of Doodlers let loose on the graffiti wall. Free and family-friendly – sip on a cold beer and lounge on Airmocks while the kids get creative in the cardboard playground. No outside food and drinks please – we rely on your support to keep the party rolling (please only buy from the official Training Shed bar). Rain or shine – see you at the shed!